Have you ever had an ache, an inner longing that just wouldn’t go away? Deep within me I have had a need to create for as long as I can remember. Music was the first outlet for me. My mother dutifully took me to piano lessons as she had with my older siblings and I struggled with commanding my childish fingers to do as they were told. One day a corner was turned and I began to feel the music. I loved to play with LOTS of expression. My mother saw the rising interest and bought season tickets for the two of us to the local fine arts series of concerts and took me to the Shakespeare Festival. I never told her because I didn’t fully know it myself, but I didn’t want to just sit there and watch, I wanted to do it. I wanted to act, I wanted to sing. I wanted to dance. As I grew, I became frustrated that my hands and my voice couldn’t reproduce the art that was inside of me. I became an elementary music teacher. It was a practical choice. As I was growing up, photography was a part of my life, as well, but it was nothing I took seriously. My father was an avid amateur photographer and one of our bathrooms doubled as a dark room. We washed prints in the laundry sink. For my 12th birthday, my father took me to a camera store and bought me my first “medium format” camera, a Yashica twin lens reflex that used 120 film. He taught me to develop BW film and make prints. Then I met and married the love of my life, Neil. He was working toward the goal of being a high school English teacher but with access to cameras and a dark room a new passion was born within him. Two years later, teaching was set aside and our studio was born. Through his encouragement, I picked up a camera once again and discovered that this was the outlet for that inner longing that I had been searching for. There is something inexpressible within me, a need to say something that there are no words for. The view through my lens is my window to the world, the print on the wall is my notebook and each person that comes before my camera allows me to take a small peak at the miracle of life that God has given us. I hope that some of what I leave behind causes people to notice, to feel more deeply what they already know to be true … to feel slightly more of whoever they are. We are excited to be launching a new and improved children's contest this year! Details to come in Febuary. You won't want to miss out!! 2008 was a year of joy and sorrow in our family, of an ending and a new beginning. Neil’s father, Bob, passed from this life in April at the age of 88. He was known by his friends and family as an avid bowler (he quit when he could no longer maintain a 190 average) and as a storyteller. He had so many wonderful stories of growing up near Minot, North Dakota; a year of living with an Aunt in Canada (after his mother died when he was 8), and getting beat up during recess by the Canadian school children for singing a revised version of “God Save the King”; traveling with his father, Nels, to Norway for several months when he was 9; pitching semi-pro baseball for money (during the Depression) at age 15; and antics with his friend, “Storley”, during WWII. The end came peacefully at home, with his wife Alice and children (Jackie and Neil) by his side, holding his hand. He will be remembered by us as a very loving father and grandfather. The joy came with Nels and Dannielle’s wedding Dec. 19 on Kauai. While the Pacific Northwest (and much of the continental US) was paralyzed by major snow and ice and power outages, we were wearing shorts and sandals and praying that it wouldn’t rain on the day of the wedding (it didn’t). Kauai was having some of the worst winter weather that it had seen. We got treated to a couple of days of torrential downpours. Did you know that the wettest spot on earth is the mountain peak on the center of Kauai? 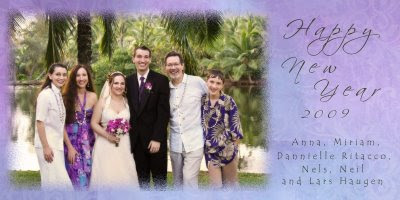 The wedding was held at the Smith Tropical Gardens with a Luau following and it was beautiful! The gardens are family owned and operated. It seemed that everyone that worked there was related and the staff was awesome. They bent over backwards to make sure that everyone was taken care of. Nels’ Grandma Alice was having hip problems and they were right there to make sure that she was taken care of at all times, even to the point of the owner staying close on one of their stretch-limo golf carts just to drive her around. When we came up short a boutonnière for Nels, one of the staff ran and made one a half hour before the wedding. Anna officiated at the wedding and did a wonderful job but she will never live down the fact that she forgot to tell Nels to kiss the bride. She was motioning them to leave and Miriam was waving her arms and hissing, “The kiss! The kiss!” Nels turned to walk down the aisle, but Miriam and Dannielle would have none of this! Dannielle was resisting being “ushered” out and Miriam was whispering “Kiss! Kiss!” Nels (after the quick start out) got the idea and planted a big one on Dannielle. Our dear friend, Cherie, came as the photographer (no, we really can’t photograph and be part of the wedding, too). The photograph on the card is her handiwork. Her son, Nick, was Nels’ best man. Dannielle’s brother, John was the groomsman. Dannielle’s sister, Sarah and friend Stacey were the Maid of Honor and Bridesmaid. A classical guitarist was hired to play. Nick and Stacey sang a duet: “The Prayer” by Celine Dion, and Nick sang “The Lord’s Prayer”. It was beautiful. All told, 25 friends and family were there to celebrate. Lars turned 10 this year with a Civil War themed party, and says that his 11th birthday should have a Revolutionary War theme. He is shooting up fast! Last measurement had him at 5’4”. What was Lars’ favorite part of Hawaii? He got to pick the restaurant that we went to one night. He looked at options in the guide book, taking into account price point, location and everyone’s tastes, talked to the concierge and came up with a very nice pasta place which 5 Haugens went to and enjoyed. Lars’ universe seems to center around food (and history)! He had fun playing in the sand and surf and even did a little snorkeling on the last day. The most eventful part of the trip for us all came in trying to get home. We were scheduled to leave on Saturday, Dec. 20 but when we tried to do online check-in, we saw “flight cancelled” for the last leg of our journey. What?! We were aware of the bad weather back home but it didn’t occur to us that they would close the Portland Airport! After several phone calls to United Airlines, we were told that the only flight that could get us home before Christmas left Kauai at 10:30 pm on Dec. 22 and got in to Portland at 9:30 am on the 23rd. We got two and a half extra days in Hawaii and actually saw the sun shine! Nels and Dannielle were supposed to have an extra three days without the family hanging around for their honeymoon but no such luck. We were all right there next door to them! When we got to Portland, we had to dig out the 3 foot pile of snow behind our van and chip off ½ inch of ice from the windows. Because the Oregon Department of Transportation had not seen fit to plow the freeway, we had to creep home on badly rutted ice and snow in bumper to bumper traffic. The trip from the airport to Salem normally takes an hour but on the 23rd it took us about 6 hours. Within a week, we were headed up to Marysville, Washington, to help Nels and Dannielle move into their first home. Between Ma and Pa Ritacco and Haugen, we got the place scrubbed and all their stuff packed and moved in. They are both so thrilled to have a home together … and also, to have their own stuff “living” with them too! They are such a happy young couple! Down home, we are facing a tremendous amount of cleanup on the property after the big December storm. Many trees are down and many that are still standing have large broken limbs swinging about high up in them. There are huge limbs and complete sections of trees lying all about on the grounds. Our little foot-bridge got crushed by TWO trees but our house was undamaged, thank goodness. We have firewood to spare! Anna, fresh off her first wedding, is mid-way through her internship-year at First Evangelical Lutheran in Greensburg, PA. She is known as “Vicar Anna”. Check out her blog and you can even hear recordings of some of her sermons: http://wordsoffaith.wordpress.com/. In the Lutheran seminary system, the third year of the four year graduate program, she is working as an assistant-pastor-in-training in a parish. She’s having a wonderful time and looking forward to completing the last year of “Sem” next year and getting into her own parish. We don’t have a clue yet what Region and Synod of the country she’ll be assigned to. We do know that she spent probably her last summer at home this year. It is very clear our older children are moving on with adult lives. Our youngest is growing fast in so many ways. And our business life is changing rapidly, but we’ll be able to say so much more next year.